Meizu has been very busy in the recent past especially given the fact that they are concentrating on the Indian market too. The MX5 flagship was launched recently and has been doing very well, thanks to the fact that it comes power packed at such a low price and with superior build quality. Leveraging on the success Meizu has started a new line of devices that will take it up a notch when it comes to the high end specs, catering to the crowd who want the latest specs with a posh build – the PRO series. And earlier today the first device PRO 5 in this series was launched by CEO of Meizu Technology, Bai Yongxiang and stated that this aims at bringing the best user experience via this metal crafted phone. The phone comes with a huge 5.7″ AMOLED screen that has a 1080p display. The screen boasts of 2.5D edges (arc glass) and comes with Corning Gorilla Glass 3 protection. With the rather vibrant Flyme OS this display should be delivering gorgeous rendering of the UI! Under the hood the PRO 5 houses a Exynos 7420 Octa-core 64-bit processor clocked at 2.1 GHz with a Mali-T760 GPU. There are two variants here: 3GB RAM with 32 GB ROM and 4GB RAM with 64 GB ROM. And for the ones who love to add more memory Meizu has this time accommodated the wish! A Dual SIM tray will allow for a micro SD card to be used in one of its sim slots that has dual role. The ROM comes with a USF 2.0 flash memory and Meizu will be one of the first companies to adopt this futuristic offering. Coming to the camera PRO 5 has the Sony IMX230 f/2.0 camera module on the rear that offer 21.6 MP and we have seen lots of phones with this lens in the recent past – Moto X series for instance. The camera also integrates PDAF phase focusing and laser-assisted focusing to significantly improve the focusing speed under complicated lighting conditions thus allowing for some real good low light photography. On the front side is a 5MP f/2.2 camera module that also boasts of a self timer option. 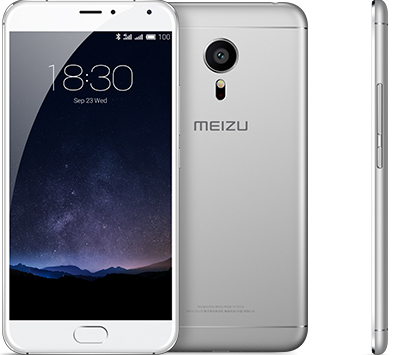 With options like finger print scanner on the front, USB Type C charger that powers a 3050mAh battery, Meizu FlymeOS 5.0 built off Android 5.1, solid metallic build and a brilliant camera module Meizu PRO 5 has certainly got its foot in the right direction and especially with the price – 438$ and 485$ for the 3GB and 4GB RAM variants respectively. There are other offerings like the OnePlus 2, Moto X Style and the new Nexus 5X (Price unknown) and Mi4C which all seem to come at slightly lower price and PRO 5 will face some stiff competition. We are told that the PRO 5 will arrive to India in a month’s time and should be competitively priced as well. We will keep you posted. Previous story OnePlus Oxygen OS 2.0 Review : In 10 crisp points!